From our kitchen to yours, we are pleased to feature this tasty recipe shared via wholeandheavenlyoven.com for you to try with our organic Cinnamon Ground. 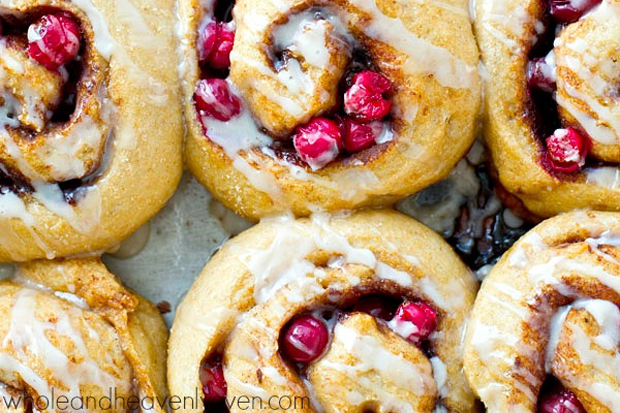 Christmas may be over but you can continue to feel festive with these Eggnog Cranberry Cinnamon Rolls by Sarah of the Whole And Heavenly Oven blog. They are convenient to make as the dough can rise overnight in the fridge. Then, rolls are shaped in the morning and popped into the oven. Get set for tasty and gooey delicious cinnamon rolls that are extra fluffy because of the eggnog. Other key ingredients include cinnamon ground, whole wheat flour, eggs, coconut sugar, and fresh cranberries. Click on image for the recipe! From our kitchen to yours, we are pleased to feature this tasty recipe shared via flavorthemoments.com for you to try with our organic Cinnamon Ground. 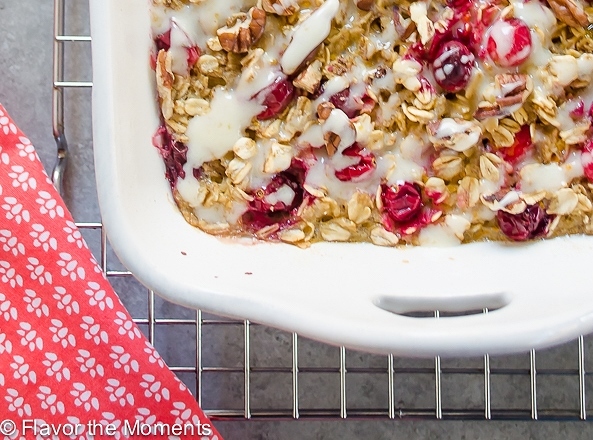 Start your day with a wholesome and flavourful Cranberry Orange Baked Oatmeal with Orange Cream Cheese Glaze. It’s perfect for the holidays as a festive breakfast or brunch, with a winning combination of fresh cranberries, orange zest, rolled oats, cinnamon ground, maple syrup and a creamy drizzle. The recipe is the creation of Marcie from the blog – Flavor The Moments. Click on image for the recipe! Nutritional Benefits: Cinnamon is very low in Saturated Fat, Cholesterol, and Sodium. It is a good source of Vitamin K and Iron, and a very good source of Dietary Fiber, Calcium, and Manganese. Dill-icious dip mix makes a great topping on baked potatoes and perogies or a dip for wedges and hot wings. From our kitchen to yours, we are pleased to feature this tasty recipe shared via panningtheglobe.com for you to try with our organic Vegetable Seasoning. 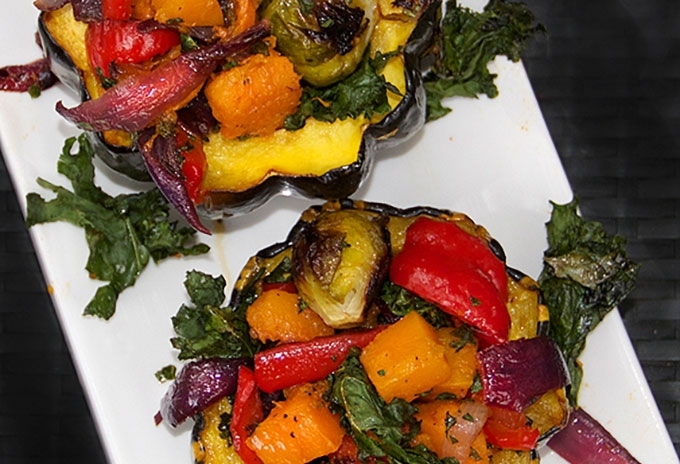 Celebrate healthy and delicious fall vegetables with this recipe of roasted acorn squash stuffed with roasted vegetables from Lisa of the Panning The Globe blog. Our suggestion is to toss the vegetables – brussels sprouts, bell peppers, butternut squash, and kale – with our organic vegetable seasoning for roasting. Click on image for the recipe! From our kitchen to yours, we are pleased to feature this tasty recipe shared via joythebaker.com for you to try with our organic Vegetable Seasoning. Vegetables reach a new level of deliciousness in this winter-friendly recipe. 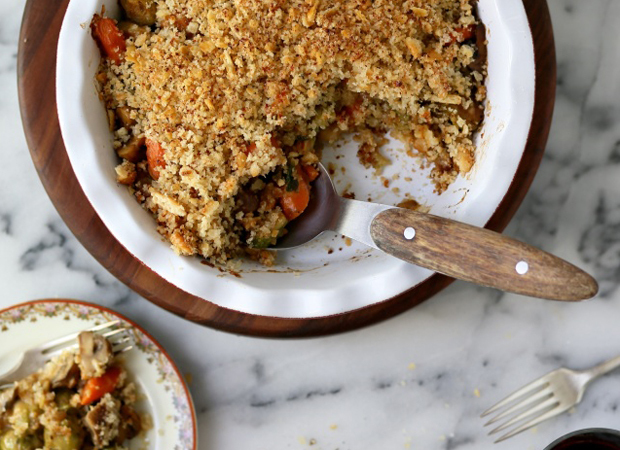 We suggest sautéeing the brussels Sprouts, carrots, and crimini mushrooms with our organic vegetable seasoning before they are combined with buttery crackers, panko crumbs, and cheese to make this savoury winter crumble by Joy of Joy The Baker blog. Click on image for the recipe! We’re celebrating the holiday season with a contest on Facebook! Choose organic for a healthier lifestyle! 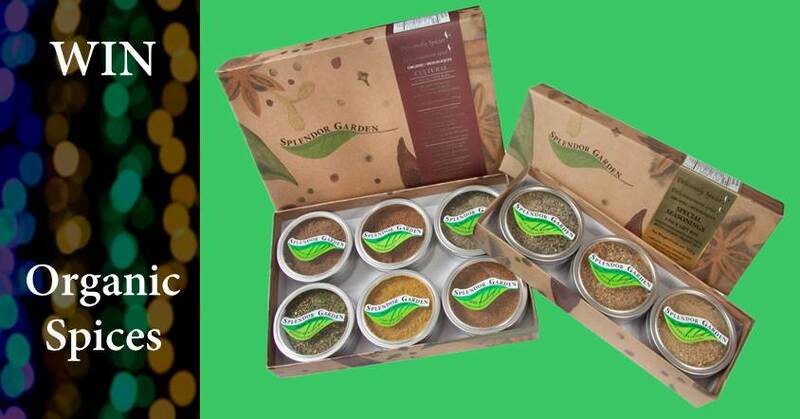 Splendor Garden is a Canadian provider of organic herbs & spices and organic seasoning blends! 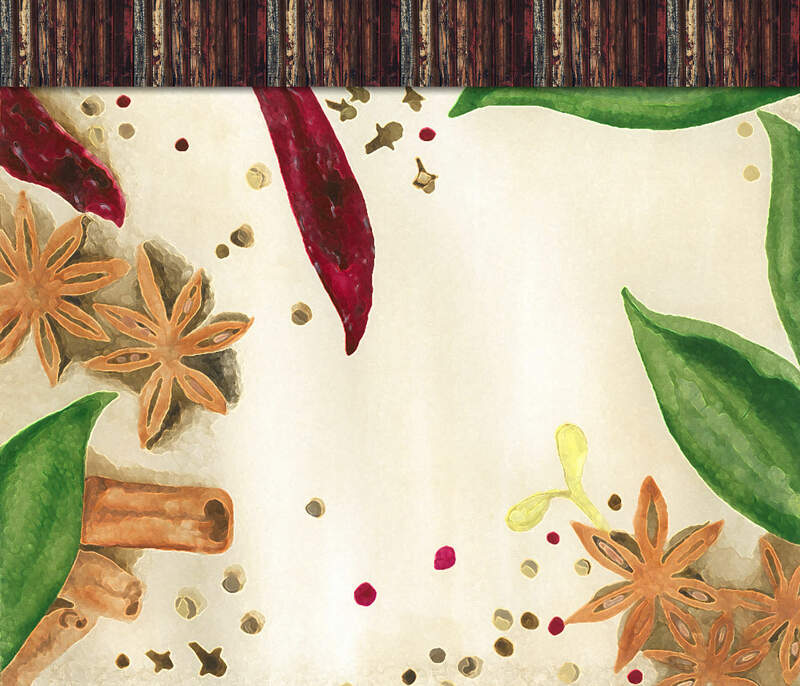 All our herbs + spices are certified organic, non-gmo, non-irradiated, and not treated with any chemicals! 3) FILL IN the entry form below. THIS CONTEST IS NOW CLOSED! THE WINNER WILL ANNOUNCED SHORTLY! Contest begins on December 14, 2015 and closes December 18, noon, 2015 (CST). All three steps (listed above) need to be completed to qualify as one valid entry. One winner will be chosen at random and contacted by Facebook or email. The winner will be included in the contest post of the Splendor Garden Facebook page. Prize is not redeemable for cash equivalent. Prize must be accepted as awarded. This contest is in no way sponsored, endorsed or administered by, or associated with, Facebook. You are providing your information to Splendor Garden and not to Facebook. The information you provide will be used for this contest and will not be shared with any other party outside of Splendor Garden. From our kitchen to yours, we are pleased to feature this tasty recipe shared via chelseasmessyapron.com for you to try with our organic Taco Seasoning “Salt Free”. 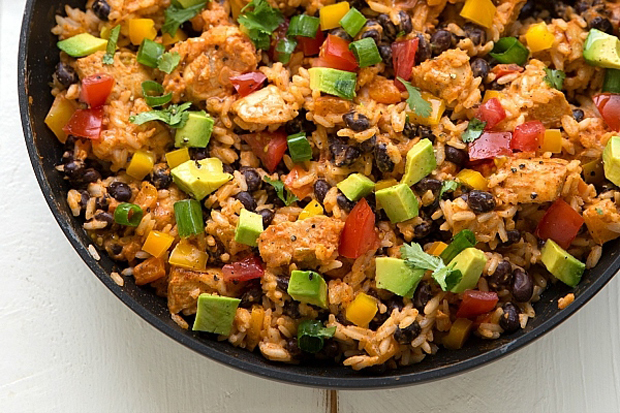 Inspired by a family for families, this creamy Mexican Chicken & Rice dish is a one skillet wonder and recipe of Chelsea from the Chelsea’s Messy Apron blog. The dish is easy to prepare and is complete with all the elements of a tasty Mexican-style family lunch or dinner, including taco seasoning, corn, avocados, black beans, chicken, sweet peppers, cilantro, tomatoes, jalapeños, chopped green chilies, and fresh lime. Click on image for the recipe.